Detjens Country Cutting Inc. was established in 1982. It is located at 109 Emerald St. in Watertown, WI. Since the beginning we have custom cut beef, hogs, lamb, bison, and deer. The business grew and we began producing homemade sausages. We currently have our smoked sausage in many of the local grocery stores. We offer a variety of beef, pork, and chicken cuts along with all our varieties of summer sausage, hot stix, wieners, bologna, breakfast links, and many kinds of brats. Our homemade ham and bacon are some of our best selling products. In the spring of 2000, two of the employees Brian Walsh and Mark Cichanofsky purchased the business from the Detjens family. They have continued to produce great tasting, quality meats. 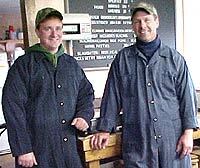 In the fall of 2007, Brian and Mark are planning to start switching over to the NORTHERN TRAILS MEATS label. It has been over seven years since there has been a Detjen involved in the business. We feel it is time to change to a name that will be more marketable. Nothing at the plant has changed, all the employees and recipes have remained the same. The change will take some time, so for awhile you will see both labels. No matter what the label looks like it will still be the same great product. Northern Trails Meats is a very small company where the employees and owners are like family. I know we are not family, but when you spend as much time together as we do we are close like family. On April 14, 2016, we lost one of our family members. Co-owner, Brian Walsh passed away unexpectedly. Not knowing what else to do; I, Mark Cichanofsky, the other owner of Northern Trails Meats and our employee family just kept doing what we do. Missing Brian every day, we continue the day to day business that needs to be done. As a customer, you may have noticed a new person coming out to the farm to handle the on-the-farm slaughter. We intend to move forward and continue to run the business the same way that Brian and I had been operating for the past 16 years. tasty meats, cheeses, and other products!! We have a great variety of BBQ Sauces, Mustards, Hot Sauce and Spices to add to your cuts of meat.